This report is a visual representation of your site file-directory tree. The list allows you to drill down into the pages of your site. You can click on the small triangles to expand the individual file directory levels to see how many visitors they received. The report is different from Most Popular Pages or Events because it is based on the directory structure in which the files & directories that make up your site are stored. Directory: is a part of the filing system containing the data that makes up your site. Directories are made up of files and sub-directories. File: smallest component of a filing system (used to store all the pages that make up your site). Visits: A visit begins when a visitors enters your site. The end of a visit is signalled by an exit click or a 10 minute period of inactivity. The next event (click) will be a new visit. Tip: We strongly recommend that you group your site content into directories and sub-directories. This will optimise your site for use with this report. 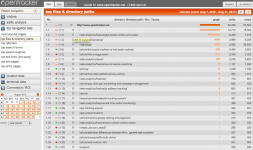 This report is a list of the files and directories which make up your site, ordered by how often they are accessed. Expand per directory Clicking on a triangle allows you to drill further down into that directory or sub-directories.